Configuring Cisco Virtual Switch System (VSS) on Cisco Catalyst 4500X Switches. | Chinny Chukwudozie, Cloud Solutions. ← Implement the Azure Invoice API in Azure Automation Runbook. As part of a network infrastructure upgrade at a client site, I’ll be implementing Cisco VSS (Virtual Switching System). This technology will go a long way to meet some of the stated objectives of this infrastructure upgrade which include : Physical Hardware Redundancy, High Availability achieved by Switch Clustering, Self-healing, Increased bandwidth (10 GB trunk), to mention a few. 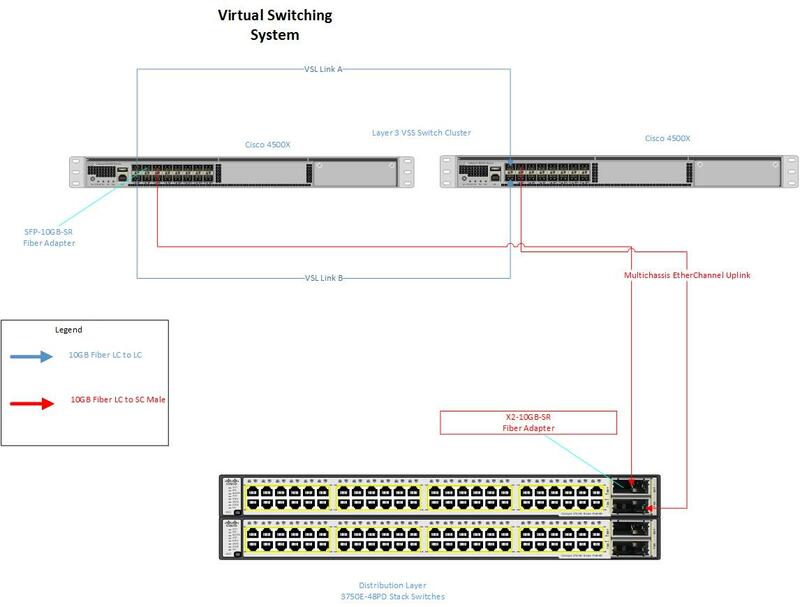 A Virtual switching system (VSS) combines a pair of Catalyst 4500X series switches into a single network component, enabling them to function as one logical switch.Cisco Virtual Switching System is a clustering technology that pools two Cisco Catalyst 4500X Series Switches into a single virtual switch. In a VSS, the data plane of both clustered switches is active at the same time in both chassis. In my VSS implementation, both VSS Switch members are connected by 2 virtual switch links (VSLs) using 10 Gigabit Ethernet connections between the VSS members. Virtual Switch Links carry regular user traffic in addition to control data between the VSS members. WARNING: Interface TenGigabitEthernet1/1,2 placed in restricted config mode. All extraneous configs removed! At this point, console into Switch-1 . You will be prompted to save the work and confirm the switch reboot. Do the same for Switch-2. VSS enables the creation of Multi-Chassis EtherChannel (MEC), which is an Etherchannel whose member ports are distributed across the member switches in a VSS. The fact that ports from both chassis of the Virtual Switching System are included in this etherchannel makes it a Multichassis EtherChannel (MEC). My MEC configuration steps are below. I configured an SVI (Switch Virtual Interface) for telnet or ssh(preferably) management. I would add that it’s important to verify that the version of Cisco IOS-XE software on both VSS switches is the same. This entry was posted in Cisco, Virtual Switch System, VSS and tagged Cisco, Cisco IOS, Cisco Switch, Ether Channel, Infrastructure Upgrade, MEC, MultiChassis Etherchannel, Networking, Port Channel, Switch, Switch Virtual Domain, Switchport, Virtual Switching System, VSS. Bookmark the permalink.